After a long day exploring the beautiful mountains of Northeast Georgia, there’s nothing better than a delicious meal cooked to order. Choose from a wide variety of dining options, from the classic Southern meat-and-three to a tender, juicy steak or even fresh seafood. The choices are almost endless! The American Catch Seafood Exchange is one of Blairsville’s newest restaurants. The Catch features fresh American-caught seafood specialties, with a locally and seasonally inspired menu. When you get the urge for fresh seafood, make the short drive to Blairsville and to American Catch! Beechwood Inn offers the best fine dining in the Northeast Georgia Mountains every Saturday featuring Farm to Table Dinners paired with award-winning wines. Each menu is pre-selected by the chefs based on what is seasonal and available that day. Most of the seasonal foods are organic and natural, many from sustainable North Georgia farms, orchards, dairies and vineyards. Reservations are needed. Beechwood Inn appreciates the history of the region and the traditional foodways. The chefs favor sustainable and local food sources, especially organic ones, to improve the local economy and ecology. The Inn is proud of the local farmers and ranchers whose names dot the menus, paying homage to those who have done the work to get such delicious ingredients through the kitchen door. Once through that door, respect and care for the ingredients play as important a role as the preparation of them. The goal is to make as much of what is used from scratch as possible – that’s what makes cuisine authentic. You’re sure to appreciate the care and devotion to freshness. 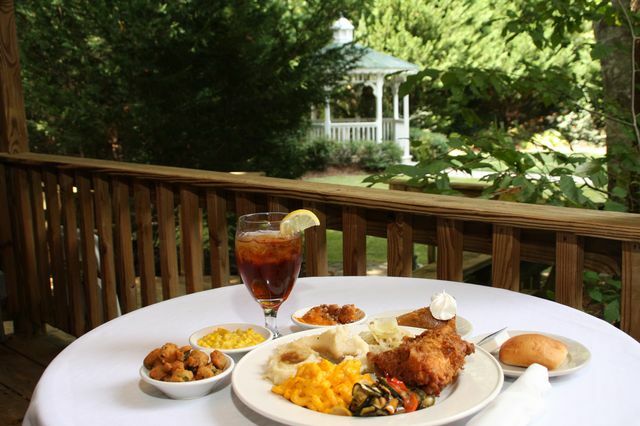 Brasstown Valley Resort & Spa is regionally renowned for its fine meals, lavish buffets and friendly service. The culinary and service teams follow a tradition of excellence in two distinctive dining settings and two outdoor pavilions. The resort’s Dining Room is known for its picturesque mountain views, which complement its outstanding meals and service. It’s equally famous for its Friday Evening Seafood Buffets and Sunday Brunches. Chef Karl Englemann prepares a variety of seasonal dishes representative of the area. Choose to dine near a cozy fireplace or out on the mountain-view veranda. For more casual dining, visit Brassies Grill for a relaxing lunch, quick afternoon snack or cozy fireside dinner. While there, play a friendly game of pool or darts or catch the game, race or spectacular replays of the day on the big-screen TV. Need a relaxing place to end a great day of golf? The Fireside Lounge and veranda is the perfect location for cocktails and conversations next to a crackling fire or under the stars. Many Brasstown Valley stories begin and end here, so it’s the ideal backdrop for friendly gatherings. Nestled among the North Georgia Mountains, Brasstown Valley Resort & Spa redefines the typical mountain getaway. Visit and experience exceptional accommodations and dining, championship golf, horseback riding stables, a 7,500-square-foot spa and a wide range of activities for the whole family. At Chateau Elan Winery & Resort, you’ll need to decide between seven restau­rants offering a cul­tural array of dishes and ingre­di­ents from regional South­ern and All-​American to Mediter­ranean, Clas­sic French, Irish and health­ful Spa Cui­sine. The ambiance and set­tings range from casual to inti­mate fine dining. For reser­va­tions, call 678-425-​0900. Versailles fea­tures Amer­i­can Cui­sine with a mod­ern twist, includ­ing some regional favorites and chargrilled steaks. Café Elan offers mod­ern French inspired clas­sics with a Mediter­ranean twist. Entrees and desserts may be paired with wines from the Chateau Elan Vineyards. Paddy’s Irish Pub is an authentic, spir­ited pub serv­ing up tra­di­tional Irish food, bev­er­ages and live music.Fleur-​de-​Lis over­look­s the lake and gazebo at the Château Élan Spa, where gourmet break­fasts and lunch dishes are served using the choic­est of healthy ingre­di­ents. L’Auberge Lounge serves a range of light snacks and din­ner items. This relaxed sports-​bar is open on Fri­day and Sat­ur­day nights to reg­is­tered hotel guests only. Le Soleil Pool Bar offers guests a light selec­tion of refresh­ing sand­wiches, sal­ads and snacks to accom­pany their favorite pool­side cocktail. Le Clos is an inti­mate fine din­ing room seat­ing only 28. Le Clos offers a prix fixe menu of five courses with the option to include Chateau Elan’s finest estate bot­tled wines or others. Golf Grille is con­ve­niently located right inside the Golf Club, and offers a great view of the #18 green and favorite golfers’ fare. The Viking Culi­nary Studio is a beau­ti­ful 1,600-square-foot teach­ing kitchen that’s fur­nished with top-tier Viking Range appliances. Glen-Ella Springs Restaurant in Clarkesville, Georgia, is open to the public and Inn guests beginning at 5:30 pm most evenings. 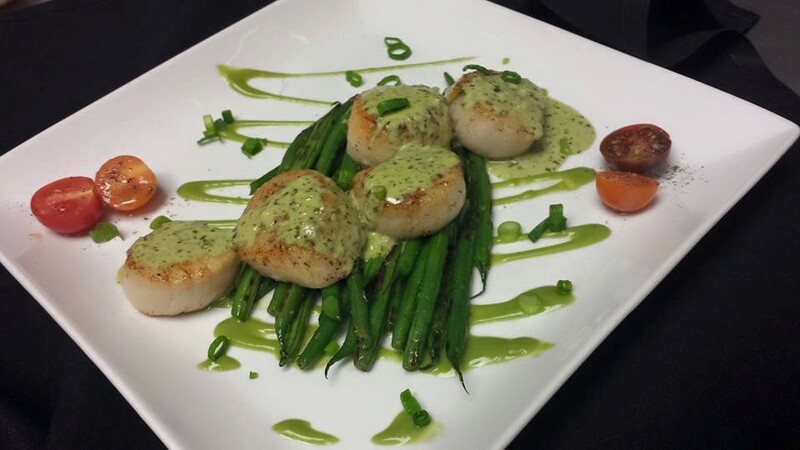 Offering one of the finest dining experiences among all Clarkesville restaurants, Glen-Ella presents award-winning cuisine in a rustic yet elegant country atmosphere. Recognized as one of the “Top Dining Destinations in the state of Georgia” by Georgia Trend Magazine since 2004, Glen-Ella Springs Inn has long been recognized as a North Georgia favorite. Guests enjoy the many signature dishes, such as Sautéed Jumbo Shrimp with peppers and andouille sausage in a smoked tomato sauce served along side a fried Parmesan grit cake, or the herb-encrusted New Zealand Rack of Lamb accompanied with a Jalapeño mint sauce, brown sugar and maple sweet potatoes and fresh green beans. Trout, steak and Macadamia-crusted chicken with a dijon cranberry sauce are also regular menu items. Nightly specials are typically seafood-inspired. Please call ahead to make dinner reservations or visit www.OpenTable.com. A private dining room is available to groups of 35 or less. In addition to regular dinner service, the restaurant is open on several holidays, such as Thanksgiving (serving a buffet lunch), New Year’s Eve and Valentine’s Day. These occasions tend to book quickly, so reservations are required. Glen-Ella also offers on-site catering services for your wedding reception, rehearsal dinner, wedding brunch, weekend retreat or family gathering. 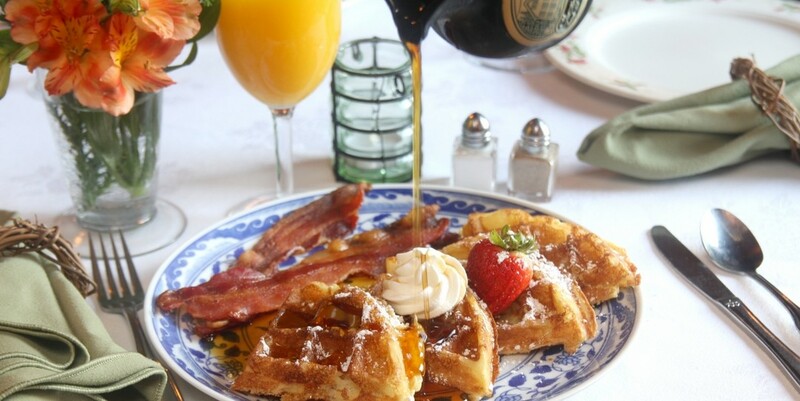 Forrest Hills Resort is open to the public every Sunday from 11:30 am to 2:30 pm for Sunday Brunch served in the Hideaway Dining room. Stop in for a true Southern comfort food dining experience! Brunch features fresh vegetables (when available), tender roast beef, famous fried chicken, sweet potato souffle, real mashed potatoes with gravy, salad bar and much more. Outdoor seating is available, and prices start at just $14.95. Reservations are not required, however it is best to call ahead with groups of 8 or more. The dining room is also available any time for group reservations. Call and reserve your banquet or Christmas party. A slate easel on the front sidewalk announces the dinner special at the Laurel Bar, which changes weekly. A recent special featured house made quinoa ravioli stuffed with lump crab and drizzled with cornsicle cream sauce. The Pastry Chef prepares luscious dessert specials daily. The Laurel Bar menu changes seasonally and all of the tapas are made from scratch, prepared from locally grown ingredients (many of the items on the menu are also gluten free). In addition to dining, the Laurel Bar has a full bar, featuring an extensive list of single malt scotches and single barrel bourbons. It also features craft beers and a diverse wine list, both by the bottle and by the glass. The reserve list includes labels such as Nickel and Nickel and Silver Oak Cabs. The Laurel Bar is quickly becoming known for its specialty cocktails and martinis, such as the Vanilla Lavender Martini, the Lemon Basil Martini and the Hibiscus Cosmopolitan. Functions hosted at the Laurel Bar include a five-course wine pairing dinner, a charity fashion show luncheon, and bi-weekly live performances by jazz guitarist Cy Timmons. Monthly activities, specials and functions are announced on the Facebook page. The White Birch Inn and Laurel Bar is available for private functions as well, and may be reserved for weddings and other special occasions.